All professionals at Avilio E. Muñoz, MD maintain the highest levels of accreditation and pursue ongoing education to stay abreast of the latest trends in the medical field. Read on to learn more about our staff's experience and training. Dr. Muñoz has been Board Certified as a Pediatrician since 2002 with an extensive international background in pediatrics, nutrition, holistic and preventive medicine. He graduated at the top of his class as a Medical Doctor from Universidad del Zulia, Venezuela in 1996 and as a Specialist in Pediatrics from Universidad del Caribe del Caribe, Bayamon, Puerto Rico in 2001. 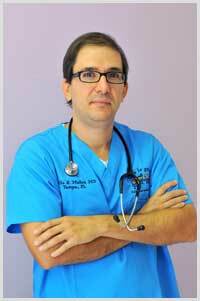 Known for his holistic approach, Dr. Muñoz combines both traditional and holistic medicine in his pediatric practice. He is interested in using his varied training to work in partnership with each child and their family individually in order to maximize their potential for physical and emotional health. Dr. Muñoz gives thanks to his father, mentor and teacher who has practiced as a Gastroenterologist for 44 years and who has incorporated Chinese Medicine and Acupuncture and prolotherapy into his practice for 11 years. When he is not caring for patients, Dr. Muñoz enjoys improving his black belt skills as a martial artist, participating in community races and spending time with his wife and two young children. At our office we offer you quality individualized wellness care from a multi-disciplinary physician. Dr. Muñoz incorporates traditional and holistic medicine and he is dedicated to providing personalized and comprehensive health care for your children and your family. When you bring your child to our office, you can expect excellent medical care, convenient service, a friendly and respectful environment, as well as resources and counsel on raising healthy and happy children. Our care is given with an emphasis on nurturing and supporting the child and their family to achieve better health now and in the future.